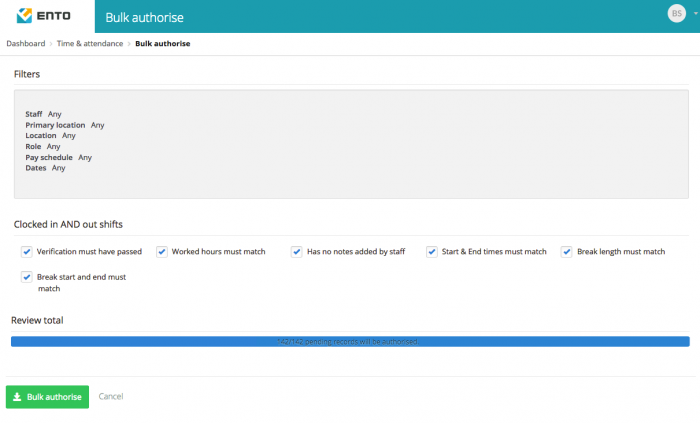 Authorise multiple timesheets that meet specified criteria at once, leaving only timesheets with exceptions for manual approval. Bulk authorisation is a way for managers to save time by authorising a large number of timesheets at once, if company policy allows for it. Go to Time & attendance > Review timesheets, or click the Timesheets shortcut from the Dashboard. Search for the records to be authorised, filtering by staff or date range, location, role or even by pay schedule. Alternatively, you can just leave it as is – it’ll default to all shifts that still need to be authorised. Selecting various criteria allows for authorisation of timesheets meeting certain conditions. The defaults are fairly stringent, but can be deselected to allow authorisation of more timesheets if your company policy allows. Selecting various criteria allows for authorisation of timesheets meeting certain conditions. The defaults are fairly stringent, but can be deselected, allowing for authorisation of more timesheets if your company policy allows. The blue bar at the bottom indicates the number of shifts that would be authorised automatically using your selected criteria. Selecting and deselecting criteria updates the bar to display the number of records that would be affected in real time. All Ento accounts have the option to bulk authorise shifts that are both clocked in and out, while some plans also allow for bulk authorising of shifts that are clocked in only, or even shifts that were not clocked in or out. This visual validation provides an indication of the impact the bulk authorisation will have before proceeding. If the number of timesheets to be authorised seems unusually large, check the filters in use at the top of the page – for example, the date range selected. If necessary, go back a page and refine the data being filtered for this approval stage, as this process cannot be reversed. Once you’ve reviewed the data to be authorised, click the green ‘Bulk authorise’ button at the bottom of the page. This process cannot be reversed so check carefully before approving timesheets in bulk. Records can still be edited by a manager, but will need to be edited and saved individually.